Dragon Magazine cover #191, from March 1993. The original is an oil painting on masonite, 17x22 inches. Like some of the others, this one is back again, due to popular demand, as a slightly smaller, open edition print. In this picture, I hid animals instead of stuff. It happened this way; I got the assignment to do a cover with a non-human on it, and happened to discuss it in front of several of my friends. My good friend Diana Harlan Stein told me that if I made the non-human her favorite non-player character, (Jandari, from the game she runs) she would buy the original. So, of course, I did. 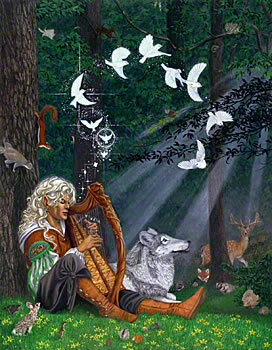 The image of an elf playing a harp with the light catching in the strings and flying away as songbirds has been with me for a very long time. So I put the two of them together. And then I put animals like budgies, starfish, and a Tasmanian devil in the woods because I could. By the way, the harper is my good friend Tim Albee, (I changed his hair color, though.) He's a fantastic artist in his own right, and has written a couple of books about LightWave, co-created TAFA (a new system of facial animation for LightWave® and Poser®,) and created a short film, Kaze, Ghost Warrior, entirely on his own. This print is now available from my Zazzle store. Prints from Zazzle aren't signed, but you can choose any size you want, printed on any of the various Zazzle papers (from cardstock to canvas.) The default size is 17x22 inches; the same size as the original painting. But you can get a different size if you want one. 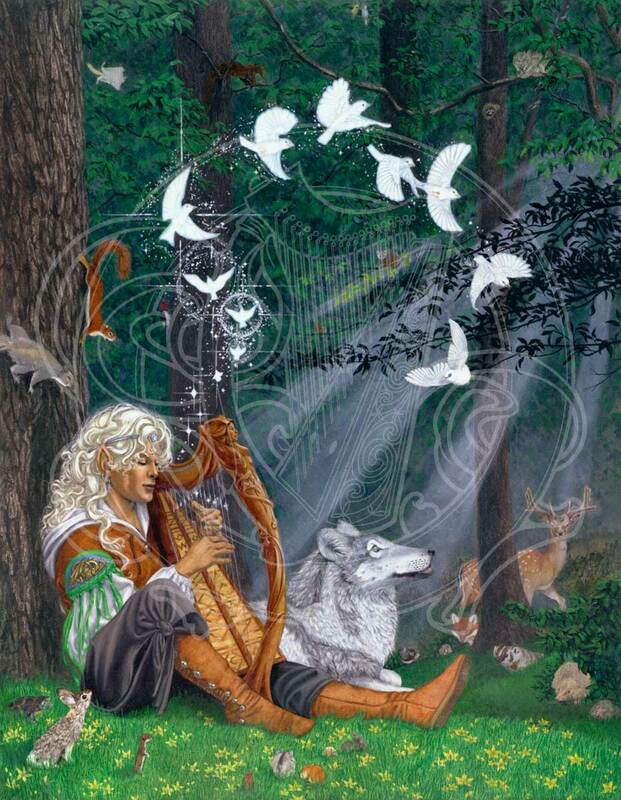 Prints from Zazzle come without a frame or mat, but you can have them framed if you want to. Besides all of that, you have more payment choices at Zazzle, and they ship more quickly. So moving things there seemed like a win-win to me. We still have 2 of these available in the signed edition. If you want one, order it soon. When those are sold out, I'm going to remove the buttons at the bottom of this page, and the signed prints will no longer be available. So, go to the Songbirds print in the Zazzle store if you'd like one! This image is on a number of things in my Zazzle store, at http://www.zazzle.com/robinwoodent*. If you would like it on something it's not on, drop me a note. I'll be delighted to apply it to any of the merchandise there for you.